It’s good to learn from your mistakes… but far better to learn from someone else’s first. Travelling is no different and seeing the best bits (and avoiding the tourist traps!) is heaps easier when you can talk to those who’ve been there and done Kiwi tours before. For real and honest traveller insights look no further than our Kiwi Experience communities online. Join, follow and like us to see what others have liked and loved about New Zealand and their Kiwi tours. Plus awesome competitions and discounts! Wondering what types of travellers you'll meet on Kiwi Experience. Or have questions about activities, budget or accommodations? We made a series of videos to show you just that! Read reviews from thrilled customers to see what they did and why they loved their Kiwi tours so much. Check out our Driver Guide profiles and their fave parts of New Zealand. If you’re still not sure on the best pass for you then feel free to contact us or come visit us face to face in our Auckland office. We’re here to help. Just by being on the bus Kiwi Experience passengers get insights not available to regular backpackers and get better discounts than the locals. You’ll be taken to unique New Zealand destinations; receive flexible travel options you just can’t get on a smaller travel network; and can be assured of making the very most of your time while here. Make the most of your New Zealand adventure with the official Kiwi Experience Travel Guide App. 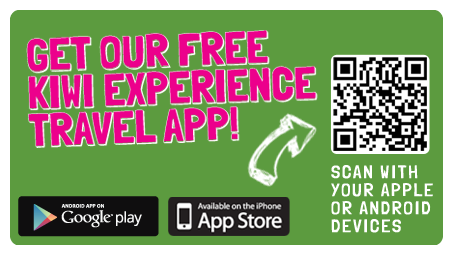 It's free to download and gives you all the information you need to enjoy your Kiwi Experience.